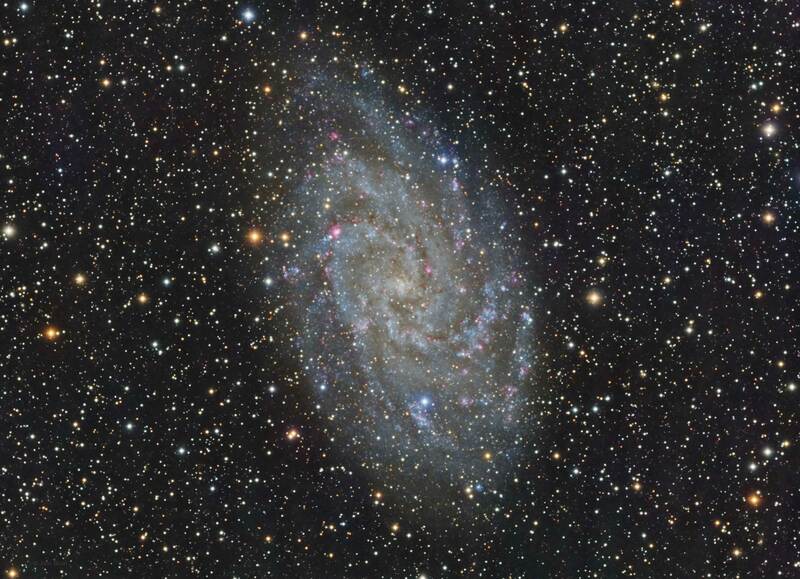 M33, also known as the Triangulum Galaxy is located in the constellation Triangulum. It is a face on spiral galaxy that is part of our local galaxy group which also contains the Andromeda galaxy and 44 other smaller galaxies. The Triangulum galaxy is the third largest galaxy in our local group at about 50,000 light years across and is thought to contain around 40 billion stars. For comparison our Milky Way galaxy is thought to have about 400 billion stars and the Andromeda galaxy contains about 1 trillion stars. At a distance of about 2,700,000 light years it is roughly the same distance as the Andromeda galaxy. M33 is moving towards our solar system at about 24 kilometers per second but there is uncertainty if there will ever be a collision and even if it does occur it will happen in several billion years. The galaxy has distinct spiral arms but appears to be partially clipped on one side and at first I thought my calibration routine may be at fault. The sudden change in brightness is seen on the left side of my image and almost takes the form of a hard line. I compared my image to some others on the internet and it appeared normal but I don’t know why there is this sudden change in brightness. There are several areas of Ha emission nebula where new star formation is occurring and the larger ones have their own NGC and IC names. The largest of these is NGC 604 and can be seen as a reddish glow in the upper left of my image. There are also over a hundred globular clusters that have been identified. These clusters contain many hot blue young stars and indicate that they are several billion years old. Other objects that have been observed include over 25 Cepheids and several supernova remnants. There was a also a black hole discovered at the center of the galaxy in 2007 and its size was estimated at about 15 times the size of our sun.